Singing Bobolink from Harold Stiver on Vimeo. 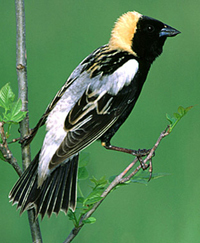 The Bobolink is one of the most visually striking passerines in North America. Males? conspicuous morphologically, behaviorally, and vocally during the breeding season? look like they are wearing a tuxedo backward, leading some observers to refer to this species as the ?skunk blackbird.? Male Bobolinks sing a long, bubbly song, often while flying low over their territories in a characteristic, helicopter-like flight. This sight was certainly the inspiration for the insightful, amusing, and onomatopoeic poem ?Robert of Lincoln,? written by the nineteenth-century American poet William Cullen Bryant. the mechanisms of orientation and navigation in this species have been rigorously studied by several investigators. Magnetic clues appear to be particularly important for migrating Bobolinks. Bobolinks have been shot as agricultural pests in the southern United States, trapped and sold as pets in Argentina, and collected as food in Jamaica. The species is not as abundant as it was several decades ago, primarily because of changing land-use practices, especially the decline of meadows and hay fields. 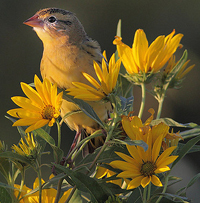 The Bobolink's tenacity and adaptability, however, should continue to serve it well. This lovely neotropical migrant has many remarkable features, but one of them makes this bird unique in North America. What is that? This is a Bobolink, Dolichonyx oryzivorus, a small New World blackbird. 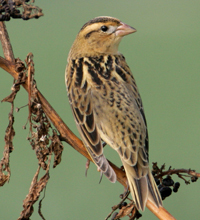 The bobolink is the only member of genus Dolichonyx. Bobolinks complete one of the longest known migrations for any neotropical songbird, breeding in the grasslands of North America and wintering throughout Argentina, Bolivia and Paraguay. They occasionally pop up in Europe, although, like many vagrants from North America, the overwhelming majority of records for this species are from the British Isles. Male bobolinks are unique among North American avifauna because their breeding garb features a black belly accented by a pale colored topside. Embedded below is a 2 minute radio programme about the bobolink, thanks to my friends at BirdNote Radio. 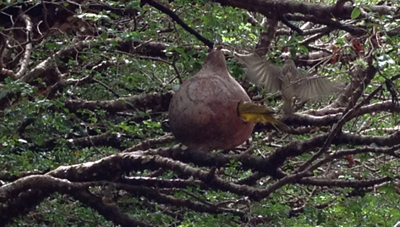 Examples of birds that make such relatively short migrations include all black-capped vireos and Lucy’s warblers, and some painted buntings, northern parulas, and gray catbirds. Other birds that winter in South America, and thus travel great distances, include: common nighthawks, Swainson’s hawks, red-eyed vireos, purple martins, barn and cliff swallows, blackpoll, cerulean and Connecticut warblers, scarlet tanagers, and bobolinks. A round-trip migration distance for many of these species is as much as 13,600 miles (22,000 kilometers). Because it?s too far to walk. 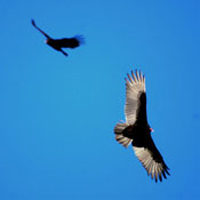 Now, seriously, the best explanation for why birds fly such great distances is it allows them to take advantage of seasonally abundant food and to avoid times when or places where food and other resources are scarce. These soaring birds must migrate by day, since the rising currents of air which enable them to soar form only during the day as the sun?s rays heat the earth. Swallows, swifts, and nighthawks are also diurnal migrants (that is, they migrate by day) because they feed on flying insects that are active only by day. Because winds at higher altitudes are stronger than winds closer to the earth?s surface, birds fly higher with tailwinds (winds blowing in the direction in which the bird is migrating) and lower with headwinds (winds blowing in the opposite direction). The speed and direction of the wind influences how fast a bird travels. Strong tailwinds (winds blowing in the direction in which the bird is flying) mean faster travel, while headwinds slow a bird?s progress. Average daily migration distances understate the amazing capabilities of migratory birds?capabilities that are put to the test when birds are faced with crossing large bodies of water. For instance, when traveling to South America in the fall, blackpoll warblers depart from New England and the southern coast of Canada on a non-stop flight which takes a minimum of 72 hours. That?s 2,000 miles (3,200 km) in three days, or an average of 660 miles per day (1,000 km/day). This degree of exertion is equivalent to a human running 4-minute miles (15 mi/hr; 24 km/hr) for 80 consecutive hours. 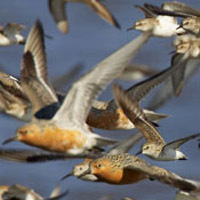 Long distance migrants have an internal clock that controls the onset of migration and the pre-migration preparations. Environmental factors set this clock and keep it fine-tuned. It is thought that certain changes in a bird?s environment stimulate the production of hormones, which in turn lead to changes in the behavior and physiology of the bird, preparing them for migration. The answer to this question is different for different types of birds, and for birds that migrate short distances (such as within the United States) rather than longer distances. For most waterfowl species and many short distance migrants, young birds learn migration routes and breeding and wintering locations from older, more experienced birds, which are most often family members. 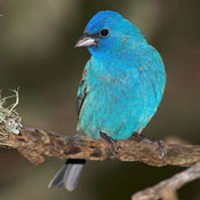 Experiments done withindigo buntings have revealed one of the cues that migratory birds use to navigate: stars. Buntings specifically use the pattern of stars around the North Star. Bird Migration: A General Survey, Peter Berthold, 1993, Oxford Univeristy Press Inc., New York. Bring Back the Birds, Russell Greenberg and Jamie Reaser, 1995, Stackpole Books, Mechanicsburg, PA.
How Birds Migrate, Paul Kerlinger, 1995, Stackpole Books, Mechanicsburg, PA.
Random House Atlas of Bird Migration: Tracing the Journey?s of the World?s Birds, edited by Jonathan Elphick, 1995, Random House, New York.